Well, i am the resident pirate here, can regularly be seen drinking Captain Morgan Spiced Gold, and i love smoking. Well, i bought the car back in 2007 after taking White Rhys's old gti for a drive. drove it around for a while, hit a cat with the fornt bumper, got brought a new one by my mates for my 21st, got it fitted and painted, then let the rego lapse when i lost my licence. upon trying to get the car back on the road, found that it had been written off back in 2001, and that the car could never be re-registered again. I then found out that i could get a surrogate vin number. After a fairly long hiatus, i decided that it was time to get the beast back on the road, so i went and applied for a new vin from the police/dept of transport which was all finalised about a week and a half ago. so now the car is back on the road, sporting new personalised plates and driving like it never has. This thing just reminds be of Voltron, like a transformer but not. maybe i should go and get a transformer sticker and put it on just to be different huh?? Active member of the HJ's Krew, Townsville branch. haha but seriously, can you spell psssssshhhhhhhhhht skow kow kow?? i can spell VL TURBO...does that count? that is the plan stan, i want to boost the swift!!! jesus has spoken then, save your pretty $$$ and we'll get started some time! Just out here beatin up on mustangs, 500 at tha ty-a!!! Swiftest_gti wrote: that is the plan stan, i want to boost the swift!!! 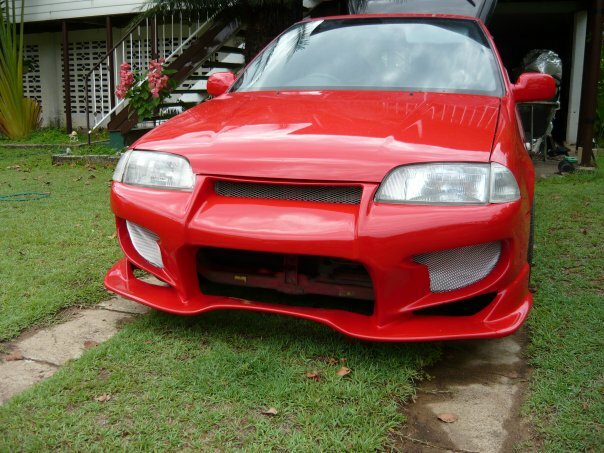 starlet gt or boosted swift hmm...??? If it were me I'd just be buying the uber box for it before boosting. Or buy a stronger car. 3000 dollars for an uber strong box in the gti.....? » MPX Rocket Fox - MK2. » What makes you a car enthusiast?